Well not the whole empire. Though the Gamilas warships are clearly outmatched by Yamato's superior Iscandarian-based human technology. We will hopefully see what happens with the Gamilas Empire in the new film, as it was left in an odd state with Dessler missing, several thousand warships destroyed, and part of the Subspace Gate network damaged. Plus some other major problems in the upper ranks due to Yamato or related problems. indeed, and when will this new movie be released? The target release date for 'Ark to the Stars" is December 6th, 2014. It is one of two films to be released this year. The other one will be out in October 11th and will be a condenced version of the Yamato 2199 story's 26 episodes into a single film. A teaser trailer for both just came out. The music and words for the second part confirm...without a doubt, that Gatlantis is coming. 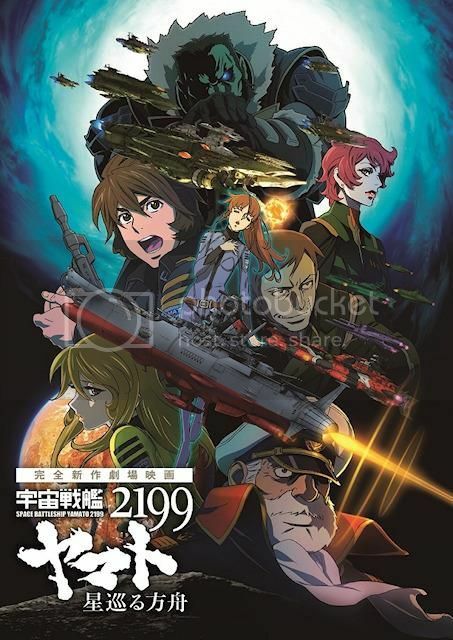 Space Battleship Yamato 2199 "Ark of the Stars"
A hidden story from the year 2199 is revealed now! Calm air flowed between the crew, who had received the "Cosmo Reverse System." They were called "Gatlantis" and demanded that Yamato be handed over. 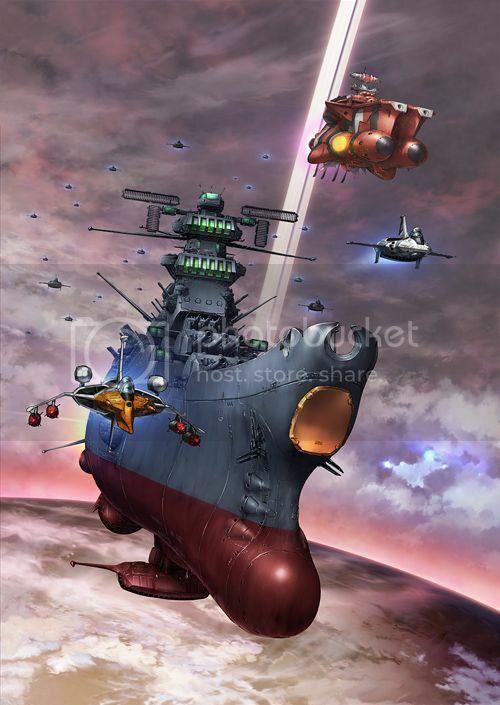 Yamato warped out in the nick of time, but in front of their eyes appeared the figure of a planet floating in a strangely-colored (light grey) space…"
The music being back means things are happening. Gatlantis is coming...and time will tell if Earth or Gamilas will survive. Website yamato2199.net updated with a new promotional image for their new film "Ark of the Stars" coming out this December. And a revised story synopsis. After reaching its destination, Iscandar, and receiving the Cosmo Reverse System, Yamato prepares to leave the Great Magellanic Galaxy. But as they reach the outer edge of the LMG, it encounters a mysterious task force. The commander identifies himself as Goran Dagamu of the Gutaba Expeditionary Rapid Assault Force, under supervision of the Great Capital City, "Gatlantis", and he demands Yamato to surrender. Yamato wants to avoid the battle and hurry back to Earth but Dagamu's onslaught increases as he unleashes a power of a beam weapon capable of transcending space. The name of his weapon - the Impact Flame Gun. It is the latest weapon of proud Gatlantis. Yamato is saved in the nick of time by warping, but they wander into a different space bathed in a pale grey light. As if controled by an outside will, Yamato's rudder turns, and they are invited to a mysterious planet. Kodai, Kiryu, Sawamura, Niimi and five of Aihara's men descend to the planet to collect information. Once on the ground, they come across something that shouldn't be there, an ancient war ship (boat). Dagamu warps after Yamato by following its space wake, reaching the grey colored space. The planet shining in front of his eyes, where Yamato was invited, is the very treasure planet he had been looking for. Dagamu heads for the planet with his Flame Gun in order to burn the annoying Yamato." Live action Star Blazers in 2017 or 18? Not sure about the idea. At least the guy who wants to do it seems like a fan and seems to want to be respectful to the Japanese with it. That at least provides some hope. Looks like, Yamato found that other craft they use to use all the time. (also the Wave Motion Gun is sealed up in this movie). The Gamilas have a Battlecarrier with a new paint job. The Comet Empire ships seen in Episode 11 (which were hand-drawn rather than CGI) get 3D CG images to match those of Earth and Gamilas. And they get there new flagship, armed with the "Impact Flame Gun". Things are happening. "Voyage of Rememberance" comes out, but the hype is for "Ark of the Stars"
The Comet Empire theme is in full force. The text can even be translated this time around. I have a question for all you Anime fans out there. I can't for the life of me remember the title of this movie so i'm hoping one of you can. Its where the hero is fighting from a One wheeled motorbike type war machine with a nice big gun attached to the side and he's fighting the bad guys in a bunch of tanks. The final scene I remember is where there is one last tank and him and its on a huge ramp. Does this even make any sense. Please help this old guy. The only thing that really comes to mind is the Venus Wars movie (it had a one-wheeled motorbike type machine) that came out in the late 80's. It's been some years since I saw it so I don't really remember much of it. Hope that helps. Pizza the Hutt: Well, if it isn't Lone Star. And his sidekick, Puke. Pizza the Hutt: Barf... Puke... *Whatever*! Thanks, I will look for that title. Hope it's the one your looking for, it really is a good movie.